Space Shuttle Atlantis is shown during rollout onto Launch Pad 39A. 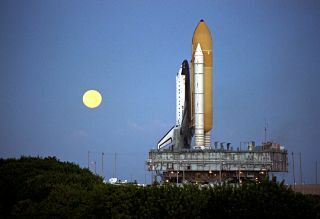 In this historical photo from the U.S. space agency, shortly before dawn on Aug. 18, 1997, a red-rimmed moon helps to light the way for the Space Shuttle Atlantis as it rolls out to Launch Pad 39A in preparation for launch of Mission STS-86. STS-86 will be the seventh docking of the Space Shuttle with the Russian Space Station Mir. Liftoff is targeted for no earlier than September 22.